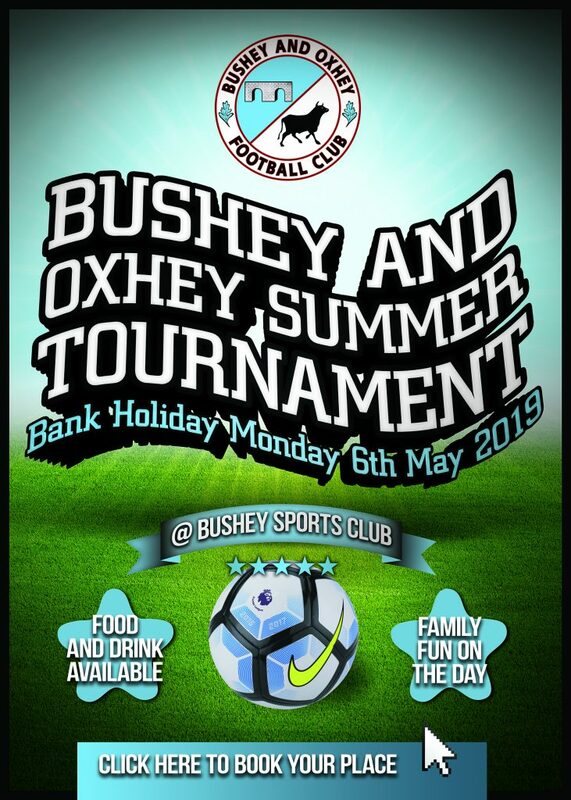 The Bushey & Oxhey FC Tournament will take place on Bank Holiday Monday 6th May 2019 at our home ground – Bushey Sports Club, Aldenham Road, Bushey, Hertfordshire WD23 2TR. Building on the massive success in previous seasons, the tournament will again host morning and afternoon competitions for ALL age groups. There will be hot and cold drinks and refreshments available including our very popular BBQ. A fully licensed bar will also be open in the clubhouse. A professional photographer will be on site and taking photos throughout the day which are available to purchase and take away with you. Played on possibly the best youth football pitches in Hertfordshire, it promises to be a fantastic event attracting many teams from across the county. Please visit the link below to secure a place in the 2019 Bushey & Oxhey FC tournament.